Edward Joseph Schwartz was born March 26, 1912, in Seattle, Washington. He spent his childhood years in San Diego, and graduated from the University of California, Berkeley, with a Bachelor of Arts degree in 1934. He received his J.D. from the University of San Francisco School of Law in 1939 and practiced law for a year before joining the U.S. Navy in 1942. In 1943 he was selected as one of 50 men to attend the Naval War College in Newport, Rhode Island, and afterward he was assigned to the Amphibious Forces in the Atlantic under the command of Admiral Bertram Rodgers. 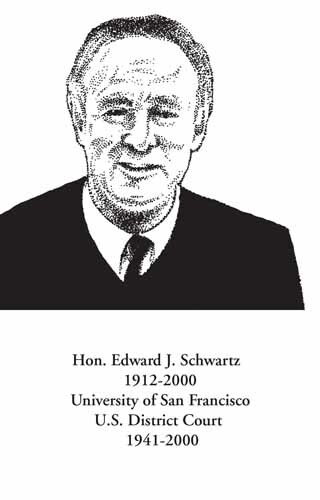 Judge Schwartz played an instrumental role in the Allied Forces invasion of Southern France which was followed by his service in the planning of amphibious landings at Iwo Jima and Okinawa. Judge Schwartz fought in both the Pacific and European theaters of World War II. He was released from active duty as a lieutenant commander in 1945. After the war, with their military service ended, Judge Schwartz and Alec Cory formed a partnership and opened a law practice in San Diego in 1946, which eventually became Procopio, Cory, Hargreaves & Savitch. In 1959, Judge Schwartz accepted a judicial appointment and left the firm for a long and distinguished judicial career. Judge Schwartz passed away on March 22, 2000, leaving his wife Gertrude and three children Susanne Friestedt, Stephen, and Eileen Boniecka.